That same year, he appeared as an amorous cad in the similarly popular Circle of Friends (1995), and went on the next year to appear as Kristin Scott Thomas' cuckolded husband in The English Patient (1996). After a comically sinister turn as Gwyneth Paltrow's intended husband in the 1998 Shakespeare in Love, Colin went on to star in two very different movies: My Life So Far, a tale of family dysfunction in the Scottish Highlands, and Fever Pitch. 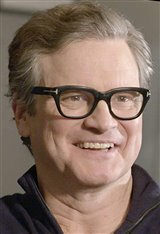 Colin appeared as Mark Darcy in the film Bridget Jones's Diary (2001), then reprised his role in the sequel. In 2010 he received his first Academy Award nomination, for his work in A Single Man. He received even more critical acclaim for his portrayal of King George VI in The King's Speech, winning a Golden Globe, a BAFTA Award and an Academy Award. In 2011, he received a star on the Hollywood Walk of Fame. Since then he has starred in a slew of films, including The Railway Man (2014), Before I Go to Sleep (2014), Kingsman: Secret Service (2014), Genius (2016), Bridget Jones's Baby(2016), Kingsman: The Golden Circle (2017) and the sequel, Mamma Mia! Here We Go Again (2018). Most recently, Colin returned to theaters in the Oscar Wilde biographical drama The Happy Prince(2018) where he played alongside Rupert Everett as Wilde's dear friend, Reggie Turner. He also appeared in the children's film, Mary Poppins Returns(2018), in the role of banker William Weatherall Wilkins.